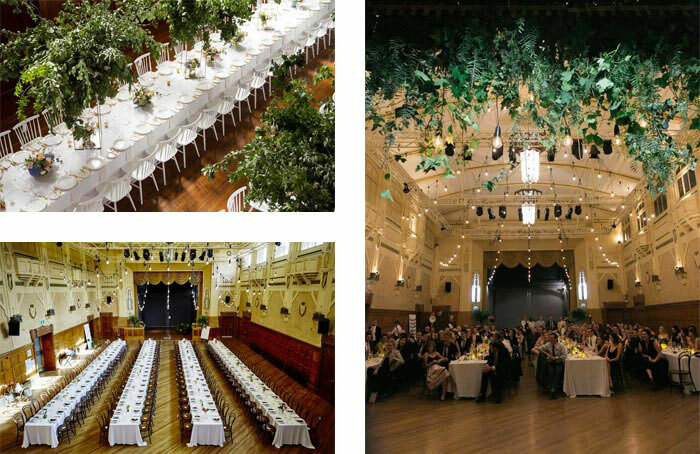 Located in the historic Prahran Town Hall (built in 1861), Functions on Chapel is an impressive venue for a wedding, celebration or corporate event. The building has ornate high ceilings and beautiful parquetry flooring, while the outdoor courtyard is a lovely place to relax. Functions on Chapel has everything you need to make your event memorable. The 130-year-old South Melbourne Town Hall is the perfect backdrop for all sorts of events. While the architectural details reflect Melbourne’s gold rush era, the venue is simple and elegant with all amenities. The venue is home to the Australian National Academy of Music, so bookings are limited. St Kilda Town Hall is a magnificent heritage landmark exuding timeless style, elegance and a powerful sense of old-time Melbourne. Built in 1890, it was designed by local architect William Pitt. The classical portico was added in 1925. The town hall is located in the heart of vibrant St Kilda and sits amid 19th-century gardens, which form a scenic entrance to the grand staircase. Fitzroy Town Hall’s classical Victorian design dates back to 1873. Think ornate architraves, a classical colour palette and ceiling features. It was lovingly restored to its former glory in 2007. Heritage areas were sympathetically rejuvenated, while modern improvements were added including a lift, commercial kitchen, and heating and cooling. It’s an impressive venue, suited to many different types of events, including cocktail parties, balls and formal dinners. An imposing space within the Fitzroy Town Hall, the Reading Room is all dark wood, chandeliers and original floor-to-ceiling bookcases. It makes for a warm and welcoming interior space, and is a popular choice for weddings, performances and cocktail events. Northcote Town Hall was designed by architect George Johnson (who also designed the Meat Market Main Pavilion) and built in 1887. A mix of different styles, including Classical Revival, Art Deco and modern, it’s a multipurpose space suitable for a wide range of functions.